There are two ACC assistant coaches this year who immediately come to mind as possible candidates for this year's Frank Broyles Award, which is given to the top assistant coach in the country: Florida State defensive coordinator Mark Stoops and North Carolina defensive coordinator Everett Withers. 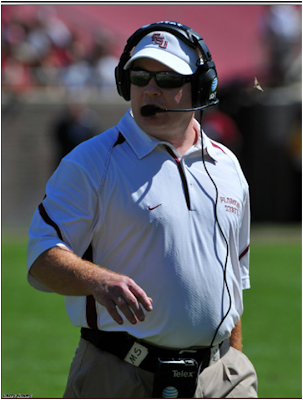 Stoops was hired to turn around one of the country's worst defenses, which he has done with remarkable speed, and Withers has managed to hold opponents to just under 20 points per game despite missing seven starters heading into the season and losing two of the country's best defensive linemen to NCAA investigations. • UNC is fourth in the country in red zone defense. • UNC is third in the ACC in pass efficiency defense and No. 22 in the country in pass defense. • UNC ranks seventh in the country in turnover margin thanks in part to 11 interceptions and five recovered fumbles. • FSU was No. 108 in rushing defense last year (204.62 yards per game) and is No. 18 now (104.86). • No. 108 in total defense (434.62) to No. 22 now (308.14). • No. 58 in sacks in 2009, No. 1 now. Both are deserving of consideration, but my vote would go to Stoops. The program hasn't been tainted by an NCAA investigation (this year), and the defensive improvement is a major reason why Florida State is still undefeated in league play.